Deciding on that perfect faucet finish for your kitchen or bath can be a difficult task! You know the look you’ve envisioned for the space and want to make sure the finish you choose really adds that extra styling touch. But there are a lot of finish options out there, and several that are really similar. Since we know as well as you do that sometimes the little differences and make all the difference, today we’re talking all about finishes and breaking down the faucet finishes pros and cons for you. 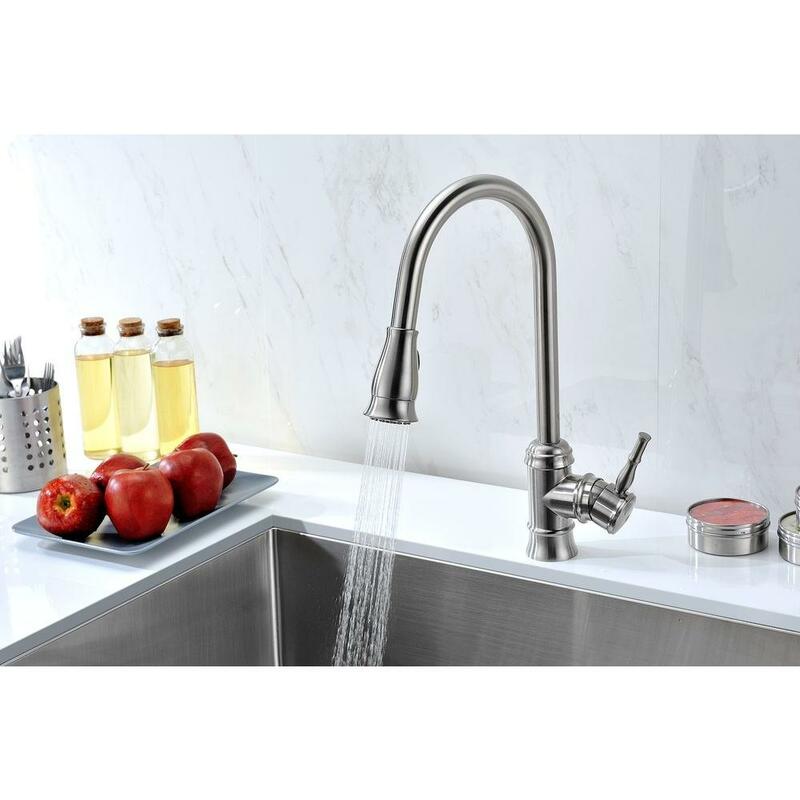 If you’re looking for something to compliment the simplistic style of Swedish “lagom”, meaning not too little and not too much, or if your décor style is more about statement pieces and finding just the right compliment while maintaining the effortless feel, you’ll leave here feeling confident with your choice of faucet finish to be the perfect addition to your kitchen sink or bathroom. Traditional, modern, Tuscan, vintage, Mediterranean, contemporary and more, there is a faucet finish that is just right for you. Polished nickel: For a smooth, shiny finish that is also highly durable, polished nickel may be the right choice for you. Pros – It looks great on a wide array of design aesthetics. It’s super easy to clean and wears well over time. It can appear to be different colors under different lighting, which is helpful if you like to change up accessories or accent colors frequently because it will easily adapt. Cons – Polished nickel can be on the pricier side depending on the style of faucet. And it can be hard to match with other accessories unless you purchase them all from the same vendor. Some polished nickel can vary in shade from dark to very light. Style – This faucet finish works with a variety of styles including traditional, modern, contemporary and eclectic. Brushed Nickel: Sounds similar to polished nickel, but this metallic finish has a warmer tone and continues to be a favorite. Pros – Its arguably the most durable of faucet finishes and keeps its smooth, metallic finish longer than chrome or an oil-rubbed metal. Easy to clean and easy to match with different accessories and other fixtures make it one of the most popular options. 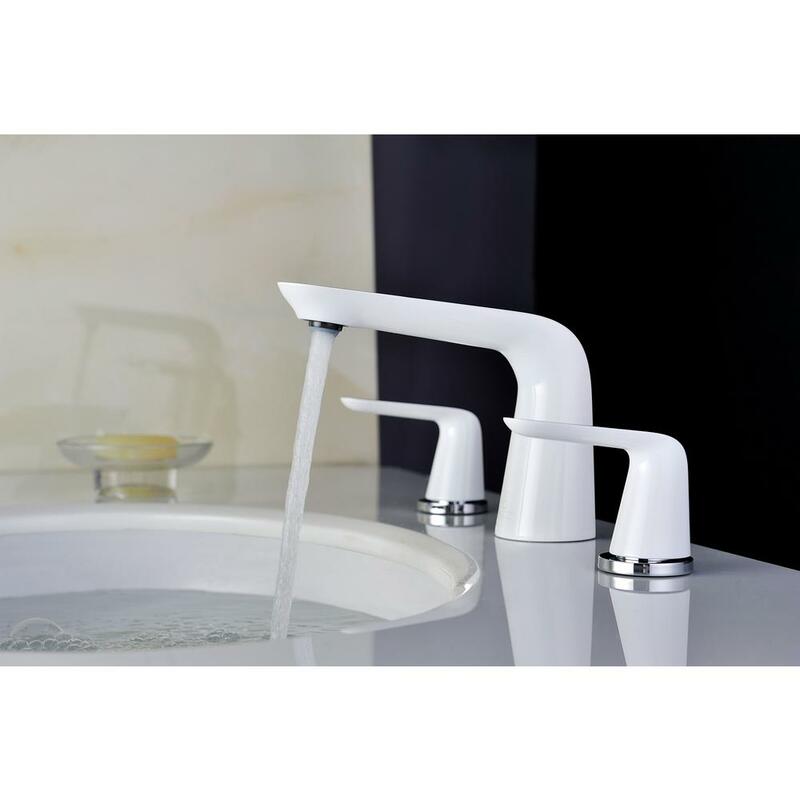 It’s also relatively inexpensive compared to other faucet finishes on the market. Cons – Brushed nickel faucets tend to blend in and don’t often stand out as a ‘statement’ piece. It also doesn’t coordinate with stainless steel well. Style – This finish works with almost any style, which makes it a great choice if you’re updating a bathtub faucet set in a rental property, flipping a fixer upper, or remodeling your kitchen with more classic, timeless fixtures. Chrome: Chrome is the most popular of all the finishes. Its shiny surface makes it stand out. Pros – Because of its popularity, it is generally the least expensive of faucet finishes. It is durable and easy to clean, although you may be cleaning it frequently. It also matches with other fixtures easily and complements other accessories well. Cons – If you don’t like fingerprints or smudges on your faucet fixtures, you’ll spend a lot of time wiping down chrome. It shows fingerprints and water spots easily, so it can require a little more maintenance than some other finishes. Style – Chrome is a great faucet finish for just about any style but can draw attention and make a statement. If you’re looking a stand out fixture, chrome may be the finish for you. Matte Black: Matte black finishes are a classic statement and have become increasingly popular over the last few years. Pros – Matte black is a versatile finish that matches well with other metals, vanities and accessories. It’s you’re making small changes and aren’t looking to change the entire room, adding a matte black faucet can be a simple update. It’s easy to clean and is great to not show water spots or fingerprints easily. Cons – It can be difficult to match other fixtures to it, but you don’t necessarily need to. Mixing black with other finishes can give the space a very modern look. But it can be harder to find and more expensive because it’s less accessible than more popular finishes like brushed nickel and chrome. Style – Generally suited to more modern or industrial styles, it also works with eclectic and contemporary design. White: The clean, fresh look of a white faucet finish can blend in perfectly with an all-white color scheme or really make a statement against a bold, colorful backdrop. Pros – Another option for an easy to clean surface that doesn’t show water spots and fingerprints, white fixture finishes look fresh, bright and timeless. Cons – Because porcelain fixtures are more fragile than metal ones, they can be prone to getting chipped or breaking with significant impact. Style – Most often used with farmhouse or modern style. Satin Bronze: This smooth finish looking metal is a cross between copper and oil-rubbed bronze. Its color is subtle making it a flexible finish depending on your personal style. Pros – Super durable and easy to maintain, satin bronze is also easy to clean. It’s a less expensive alternative to copper and oil-rubbed bronze while still giving the space a unique look. Cons – Satin bronze is generally more expensive and can be difficult to match accessories and other fixtures to. Style – Most commonly seen used in traditional or Mediterranean style spaces. Copper: A rich, bold finish that can be an excellent accent to marble counter tops. Copper is unmistakable. Pros – It makes a bold statement and is relatively easy to find. The metal itself has antibacterial properties and if it gets scratched, over time the imperfection will ‘heal’ itself and blend in with the surface. Cons – It may require a little more maintenance then the more common chrome or brushed nickel finishes and can be a more difficult to match with other non-copper fixtures and accessories. But as copper ages naturally, it develops a beautiful patina – a thin layer that forms over time as the copper comes in contact with moisture oxygen and sulfur-based compounds. The patina acts as a barrier to protect the copper against corrosion and can be beautiful and unique in its appearance, which is why it’s popular with faucets for kitchen sinks. Style – Best suited for farmhouse or Tuscan style, but can be a great compliment to a more traditional design aesthetic. Oil-Rubbed Bronze: If you’re looking for something other than chrome or brushed nickel that is still a great compliment to traditional style and design, oil-rubbed bronze may be just the right finish. And if you’re trying to limit your out of pocket expense, you can save money by taking existing fixtures and using a brass darkening solution to make the other hardware in the space match. Pros – It’s durable, easy to find and easy to clean. It is also easy to match with other oil-rubbed bronze accessories and is a great surface for hiding water spots and fingerprints. Cons – Oil-rubbed bronze can be more expensive than other finishes like chrome and brushed nickel, but there are ways to still enjoy the style and work within a budget. Style – This faucet finish works best with traditional, Mediterranean and Tuscan design styles. Satin Brass: Stain brass is a gold-brushed finish and looks bold and classy without being overly flashy. It’s becoming more popular in bathroom faucet finishes. Pros – Its matte finish will do well to hide fingerprints and water spots. It’s also really durable and adds a nice, subtle color to a dark countertop or fresh pop to a light one. Cons – It can be difficult to match with other fixtures and accessories unless you’re going for a completely cohesive look in which you can purchase all of them from the same vendor to ensure the most accurate color match. Style – The best settings for satin brass are found in modern, contemporary and traditional design spaces. Polished Brass: If you’re looking for a vintage style finish, polished brass is your thing. Pros – It’s durable and much easier to match to accessories and other fixtures than some other finishes. It’s also pretty easy to find and maintain. Cons – It is more expensive than some other finishes, but because of its unique and versatile style, it just may be worth the extra investment. Style – Polished brass has been making a more regular appearance in bathroom remodels and kitchen updates as of late – it’s definitely one of the more popular faucet finishes for 2018! It looks great in a variety of design styles including traditional and modern. Concerned about mixing finishes in the same space? If you’re a neat freak and want the easiest surface to maintain, what finish is for you? The pros and cons of each finish will give you an idea what compromises you are willing to make in the name of style and function. STYLE: Think about your style and what makes you happy when you walk into a room? Is your style more modern or more traditional? Understanding your personal design style will go a long way when trying to narrow down your choices. UNIFORMITY: If you’re still confused, choose bath and kitchen faucet finishes that best matches the rest of the hardware in your home: lighting, towel rods, door hardware, cabinets. Some finishes have warmer golden undertones like brass, and copper. But more silver undertones tend to be more neutral like in chrome, stainless steel and brushed or polished nickel. But don’t be afraid to mix finishes. It can create an interesting and stylish look that is distinct. Multiple finishes can add contract and dimension – just be careful not to get carried away. Think harmony and cohesion. Find like metals that work together to create different textures without being distracting. For example, door pulls and accessories in shiny chrome can be a more affordable compliment to a stainless steel faucet because chrome, nickel and stainless are all neutrals. One way to find a focal point is to choose finishes that are all brushed or all polished, unless you’re incorporating some neutral surface finishes. Or, mixing metals with black or white fixtures can add a metallic pop that is both stylish and classic. PRACTICALITY: For homeowners with kids, the most important factor in choosing the right faucet finish just may be one that is easy to maintain, clean and won’t show smudges and fingerprints easily. In this case, choosing a practical faucet finish may be a higher priority than one that is stylish or unique. Stainless steel and chrome are easy to clean, but are also well known for showing every little smudge and fingerprint left behind. DURABILITY: While durability may be a consideration when determining the right faucet finish for you, it may not be the most important. Due to recent advancements in technology and materials, faucets are designed for wear and tear making them longer lasting. Opt for durable faucet parts (like brass) and your faucet should be sturdy for years. MAINTENANCE: Matte finishes are best to avoid the appearance of fingerprints and water spots, but if you don’t mind the general upkeep – the bling of more polished finishes can really make a statement. PRICE: While chrome is the most inexpensive of the faucet finishes, brass and bronze are on the more expensive side. The customized look of oil-rubbed brass or bronze provide such a unique style that many people are willing to pay. Consider your budget, how much you are planning to spend on bathroom or kitchen sinks faucets and narrow down the finish options that work best for your personal design aesthetic or the use of the space. Considering these factors, you can almost always find affordable options that will complement any style. All of these factors in consideration will help you to determine the right faucet finish for your lifestyle, budget and design aesthetic. Which one is your favorite?